It's summertime and Memorial Day. Can't you just smell the mouth-watering aroma of burgers on the grill, wafting over the backyard fence? As we all know, a grilled burger is simply delicious. But sometimes you want a burger that is more — so for braggin'-rights burgers, add extra touches that are the hallmark of bistro-style cooking. You know — special sauces and condiments, intriguing flavors and bold colors that will transform your backyard burger into a signature dish. Start off with good, premium beef and go beyond the standard ketchup and mustard. 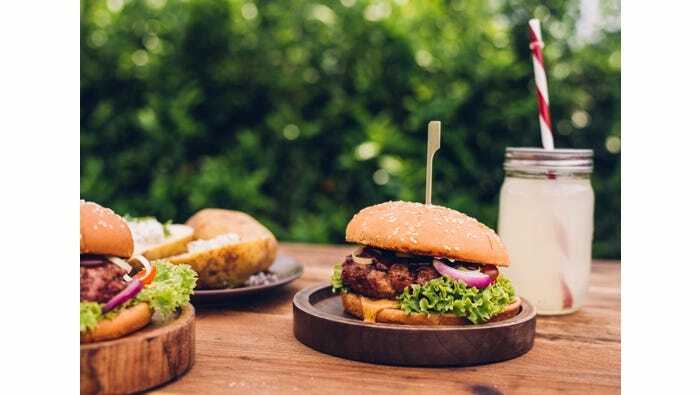 Complement the beef with crisp lettuce and juicy red tomatoes from the garden, bakery-fresh buns, chipotle mayonnaise, mellow or sharp cheeses, sautéed onions, strips of bacon, your favorite barbecue sauce or delicate shiitake mushrooms and grilled pineapple. For the best braggin'-rights burgers, as with any great dish, it's all in the details. Log in below for some great burger tips and recipes. Never season burgers with salt and pepper before cooking. Salt dries out the meat and pepper is a matter of taste — so let your family and guests put the amount of salt and pepper they want on the burgers after they are cooked. Cook burgers to an internal temperature of 160 degrees; the center may still be slightly pink, but the juices will run clear. Avoid patting down burgers with a spatula because this will push out the juices and cause flame-ups. If serving with cheese, melt on burgers for 1 to 2 minutes before removing from the grill. Thaw frozen burger patties overnight in the refrigerator, or for a quick method, place the vacuum-packaged burgers in cold water for 30 to 45 minutes.